Decades ago, going to a public school in Uganda would guarantee you an education. You would be sure of a good job. The government supported public education. Unfortunately, educational opportunities for Ugandan children are not what they once were. Ugandan children have little chance today of attending a University and getting a good job. The education system has become commercialized, and the average Ugandan cannot afford a good education. Those who can afford it do not always choose to go to school. The value of education provided in some schools is questionable, since many schools are more interested in assigning high grades than providing quality teaching. To understand where we are, how we got there, and what can be done about it, one must review the history of education in Uganda. For many generations in Uganda, education was provided in an informal home setting, and teaching was done orally by sharing stories, ideas, and facts. Morals and etiquette were also taught at home. Fathers typically taught boys to hunt, gather firewood, and do manual labor jobs. Girls learned to cook, fetch water from the well, cultivate, and make a home from their mothers. While hunting, boys were told stories of past warriors, heroes of old, and bravery, and they were encouraged to learn survival skills. Girls were told stories about love, family heroines, and they were taught how to build family loyalty. In the evenings, everyone gathered around the fireplace. They told stories, riddles, and proverbs. This was a time for the elder family members to teach the younger ones. Extended families lived nearby each other, ensuring support and help. If a young person’s parent died, the other elders would support them. Family structures were often polygamous, though in many households, all wives were afforded respect. If a child said that their “mother” said something, they may be referring to a biological mother, aunt, or a step-mother. In the African setting, all maternal leaders were held equally high. Discipline was handled communally. An adult could discipline any child, regardless of who the biological parents were. The challenges in Ugandan education today are many. Today, a quality education is too expensive to be attained by the average Ugandan. Private schools often over-emphasize passing examinations and fail to encourage quality teaching. Because the government support for schools has declined, the quality of education in public schools is also declining, and they can no longer compete with private schools. Private schools have become very focused on student recruitment and increasing revenue, and as a result, education standards are suffering. As a result of these challenges, the Ugandan education system needs to be reformed in several ways. First, a quality education requires an infusion of moral principles that reflect the community’s values and aspirations. Emphasizing education of the whole child by providing spiritual instruction and developing character are critical to ensuring that children grow to be successful, healthy, thriving adults. Second, more investment in the professional development of education leaders and especially, teachers, is needed to improve education quality and outcomes. Third, a practical emphasis on acquiring skills needed to prepare for good jobs that will build communities and our economy is essential. Finally, improved resourcing for schools is critical. Most schools do not have basic facilities like libraries, laboratories, computers, or sports equipment. Support to establish resource centres, libraries, and after-school reading programs are likewise the quality of education. In addition, an emphasis on co-curricular activities will help students develop appropriate practical and life skills. Professional, trained, and caring leaders who provide support for students through mentoring, tutoring, spiritual instruction, and will help underprivileged students who cannot afford to attend the best schools. For the average Ugandan, there is need for such support to give students a chance at a meaningful education and a purposeful life. This is exactly what Rising Star Ministries is doing now. 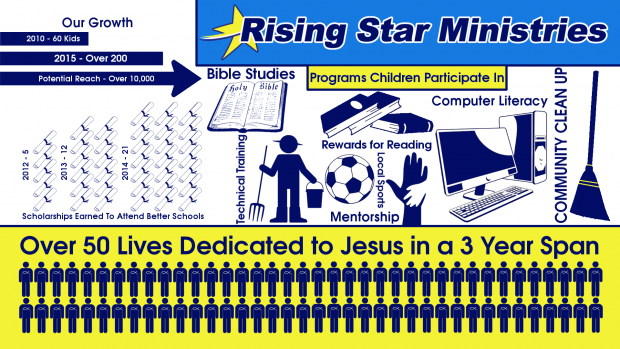 The ministry has a spiritual, academic, and sports program. The spiritual program helps instil morals in children, and to point them to Christ. The academic program, which involves providing reading materials, computer studies, and an after school teaching program where the children’s education is supplemented, especially in areas where they are weak is helping to improve on the quality of education. The sports program gives the children an opportunity to develop their skills and talents, and to take advantage of the benefits of sports, such as sportsmanship and character development. The support of these three programs will therefore go a long way in improving the quality of education among the beneficiaries. This support can be logistical in terms of school resources like computers and books, moral, through prayer, or actual physical participation. As the children are being trained, they are being equipped, and their stars rising academically.